Powerful motor - At the centre of the Bosch AVR Verticutter is a very powerful 1100 watt powerdrive motor which works together with an advanced gear set to increase the torque when necessary to achieve an optimum performance in all situations. Smart jet collect system - The Bosch AVR has a smart jet collecting system with 14 stainless steel blades which not only lifts the surface debris but also ensures that deeper rooted thatch is eliminated. Large grass box -This machine comes with a large 50 litter grass box which is reasonably sized and helps to keep the machine less bulky. Easy to store - The Bosch AVR has a two piece construction with a double folding handle which makes it easy to disassemble and store. Flexible - With a 32 cm working width and four work height settings which range from -10mm to +5 you get enough flexibility to make the machine meet your needs. Powerful power drive motor - The 1100 watt powerdrive motor works together with an advanced gear set to increase the torque for optimal performance. Compact storage - Due to the double folding handles and a specially designed 2 piece stackable collection box the storage becomes very compact Generally, this is a powerful, versatile verticutter mostly recommended for medium sized lawns. Easy to empty grass box - The grass box collects and compact moss and thatch to help in its emptying. Powerful cylinder rake - The Flymo Lawnrake Compact 3400 cylinder rake helps in the removal of unwanted moss and thatch. Easy to store - This machine has been designed for easy storage in the sense that it can be folded down and stored neatly away with a storage height of 46 cm. Easy to assemble - The Flymo Lawnrake Compact 3400 is usually assembled to some level when delivered to the client hence it is very easy to assemble. Easy to empty grass box - The grass box collects and compact moss and thatch to help in its emptying. Generally, the Flymo Lawnrake Compact 3400 is an excellent kit which can be easily assembled, maneuvered and stored and is also a very versatile machine. The Einhell BG-SA 1231 can be stored using a minimal space since the handle can be folded at two points folding neatly across the driving unit. This bag is not that big hence you can always leave it behind as you rake the lawn then go over the lawn with a mower to pick up the loose moss and weeds. With the 1200 motor power, you can easily work across the lawn without having any problems. The aerators come with alternative rollers which can easily be changed through two Allen screws to which a correct key is supplied. With a weight of 10.4 kgs, it is very easy handling this machine. The first thing you will note when you purchase The Einhell BG-SA 1231 is that it is very easy to assemble the handle and the collecting bucket. After you have assembled it, you will realize that the machine is robust looking and well made. Storing is the Einhell BG-SA 1231 is very easy with the least space since the handle collapses at two points folding neatly across the driving unit. Generally, this is a solid machine that will not disappoint you from its performance to storage. 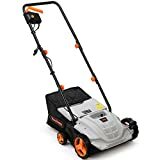 The VonHaus 2 in 1 Electric Lawn Raker/Scarifier and Aerator is an electric corded tool that offers a great performance for most domestic gardens. The cord has a length of 10 metres which can obviously be used in conjunction with an extension lead if this is not long enough alone. Being electric means the unit is quite a lot lighter than the petrol alternatives, in fact at just 8.5kg it is less than half the weight of most petrol comparatives, and this gives it a great deal of manoeuvrability and makes it easy to move and store. The handle is also height adjustable to suit the taller or shorter operator. The motor is 1500w and there is a 2 stage starting switch to ensure safety and no accidental operation. Setting up the unit when it is first delivered only takes about 10-15 minutes and is simple and easy to do, with clear instructions provided, it just requires a cross head screwdriver which isn’t included. The unit comes with 2 rollers which are easy to change over, the supplied Allen key means you just remove the locking nuts and change the blade, but again the instructions are comprehensive and easy to understand. The aerating roller is also the roller that does the raking work, and there is a usefully large 40L collection box on the back for collecting the debris. The scarifying roller has 4 adjustable working heights to ensure you get the best results for your lawn, and switching between the levels is easy. Von Haus is a well known name in the garden tools world, so you know that this will be a quality piece of kit that offers great performance, a fact testified by the included 2 year warranty - a sure sign that the manufacturer is confident in the ability and durability of their product. 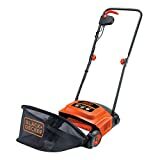 The Black and Decker GD300 30cm Lawnraker is a powerful tool for your garden, with many winning features to compete with other models. The raker features a powerful 600w motor, as well as a 30cm raking width to give you an efficient and controllable raking experience. Furthermore, an added safety feature in the form of a lock off switch, means the model will automatically switch off if you take your hands off the handle, and a simple cable management system prevents the cable from coming into contact with any part of the raking mechanism. The central height mechanism has three settings, allowing for a variety of different ways to rake. The first setting allows you to remove the debris and thatch that has gathered at the bottom of the grass, and is used for a vigorous raking. The second setting is recommended for use when the lawn needs a standard raking, and is suitable for the majority of lawns. The third and final setting allows for a gentler rake, collecting the grass cuttings and fallen leaves you may have on your lawn. All cuttings and leaves are stored in the large detachable bag, great for easy removal of waste. Overall, the GD300 is fantastic for gardening enthusiasts who want to give their lawns that extra bit of tender loving care. The adjustable levels of raking and the added safety features mean this is an excellent choice for a wide range of user. It is not heavy and it is easy to operate. 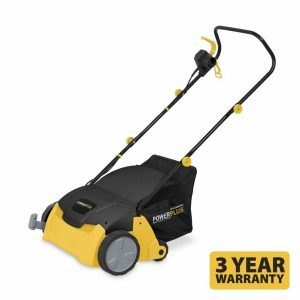 The Powerplus 1300w 2 in 1 Electric Lawn Scarifier and Aerator is a great example of gardening technology, which has a range of features to appeal to garden lovers who want to do more with their lawn. Boasting a 1300w motor, this scarifier is a powerful piece of technology, guaranteed to scarify lawns with ease. The 320mm working width allows for superior control and manoeuvrability. The model also comes with collapsible handles to be stored easily and conveniently. Five separate cutting heights allow complete control over the type of finish you have on your lawn, ranging from –10 to 10mm. The model is lightweight yet durable, built to be efficient and responsive. The 30 litre collection box that attaches to the body allows for a large quantity of cuttings or leaves to be collected, and detaches easily to enable quick disposal of waste. The model features 18 needles and 10 knives which compliment the 320mm working width very well. Overall, the 2 in 1 is an excellent investment. The dual function creates a versatile tool that does the job efficiently and quickly. The powerful motor and separate cutting heights allow for both a controlled yet meticulous finish to a lawn. The product also comes with a three year warranty as standard, meaning you’ll never have to worry breakdown and shows the manufacturers have confidence in their product. This is a great feature packed piece of kit, that is lightweight and easy to operate, making it perfect for any home garden. What is a Lawn Scarifier? A lawn scarifier is garden maintenance machine that looks like a lawn mower. This makes sense as it also functions on garden lawns, although its purpose isn’t cutting the grass. Instead, it works to aerate the lawn by removing a layer of vegetation known as thatch. It looks almost identical to a lawn mower, coming with four wheels, a handle, an engine, and rollers, although it doesn’t have a rotary blade like a mower. Why Use a Lawn Scarifier? Mowing the lawn is one of the most common types of garden maintenance, yet almost nobody considers using a lawn scarifier, which is arguably just as important. While not needed as frequently as mowing, this is an important form of maintenance that will significantly improve lawn quality. Over the seasons all types of natural debris accumulate on a lawn. This includes moss, dead leaves, roots, clippings, weeds, and other types of debris. When left untreated, which often happens during winter, this debris builds up across the surface of a lawn, hampering growth by limiting the amount of water, air, and nutrition that penetrates the soil. As a result, lawns with too much thatching become over-acidified and lack a healthy growth. By using a lawn scarifier you can remove the lawn thatch to aerate the soil, helping restore it to its natural appearance. Just like a lawn mower there are several types of lawn scarifiers available. Differences are typically the power source and the type of cutting device used to aerate. Manual - A manual lawn scarifier features no power source, being operated entirely by pushing the tool across the lawn to aerate the soil. These are suitable for smaller lawns measuring up to 100m2. Electric - Electric scarifiers are more suited for average size lawns between 100-500m2. They are plugged into a power source like an electric lawn mower to power the cutting device, which is usually a blade, teeth, or claws. Petrol - Petrol scarifiers are the most powerful type available and suitable for large lawns upwards of 500m2. While much stronger they also require more maintenance, namely engine components like spark plugs and filter, while oil changes are also common. A lawn scarifier is also categorised by the cutting mechanism used to aerate, being classified as either bladed or an aerator. Both work to aerate the lawn to make it healthier and improve growth, although each one achieves this differently. For example, aerators are fitted with either claws or teeth. These attach to the lawn thatch to help clear the surface area, which allows air and water to better penetrate the beneath the soil. It mostly removes moss build ups from the surface and isn’t recommended for lawns bigger than 300m2. Bladed scarifiers feature a series of small blades that actively cut up natural debris in the lawn thatch. Rather than simply removing them, they chop up moss, leaves, and weeds as they pass over, gathering the loose clippings into a collecting bag like a lawn more does. By destroying the plant matter and raking the soil, the blades are generally more efficient than aerators, making them better suited for lager lawns. They are also much more power, so are usually found in electric and petrol lawn scarifiers. What does a scarifier do to your lawn? When should I scarify my lawn? You only really need to scarify your lawn once or twice a year, although this depends on the condition of your lawn, with most doing it growing season. For instance, it’s usually a good idea to scarify the lawn at the beginning of spring and the growing season. This is because lots of debris accumulates over the winter months, especially when the lawn isn’t getting mowed. It’s often a good idea to scarify the lawn before the winter too, around late autumn time, as the build up leaves is a common cause of lawn thatch, as does the growth from throughout the growing season. Can you scarify wet grass? It is not a good idea to scarify the lawn when it is wet. While you want the lawn to have some moisture present before scarifying, doing so on wet grass is not recommended as it may cause the lawn scarifier to pull up healthy grass growth rather than dead matter lying on top of the surface. 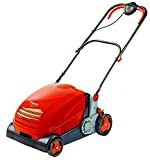 How often should I scarify the lawn? Scarifying your lawn once or twice a year should be more than enough. Doing this during the growing season is recommended, as you want to remove as much lawn thatch as possible before peak growth to ensure healthy lawn growth. Lawn thatch is the name given to the debris that accumulates on the surface of a lawn over the weeks and months. Dead plant matter such as grass clippings, weeds, and moss build-up across the soil surface of the lawn to create a thatching that blocks water, air and nutrients penetrating the soil. Do I need to dethatch my lawn? Yes, detaching or scarifying your lawn is advised if you want healthy and vibrant grass. Lawn thatch deters growth as it blocks the soil, making it difficult for water, air, and nutrients to naturally pass into to soil and encourage healthy grass growth. So, if you want the best lawn possible you need to dethatch a few times a year. How do you use a lawn scarifier? A lawn scarifier works almost identically to a lawn mower. Set the scarifier to the highest setting and then start passing over the entire lawn surface like you would when mowing. Make several passes over the lawn to ensure all lawn thatch is properly removed, reducing the power settings on each subsequent pass.